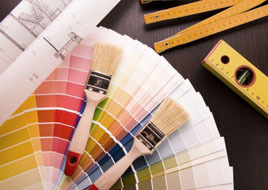 Shown below are a few of our less extensive home improvement projects. In all these examples, complementing the existing architectural detailing of the home was paramount in the design, and the installations were all challenging due to building code restrictions or the existing structural and wall material conditions. We did the designs and handled the actual installation of the improvements, and the cabinetry & wood components were designed and fabricated in our woodworking studio. Move your mouse over the photos to see what the space looked like before the improvement project was completed. 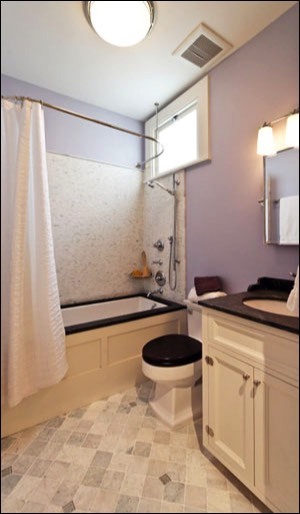 The basic layout of the bathroom shown above was not changed, but in almost every other regard, the room is a new design. To keep the costs within the budget constraints, the layout of the room and placement of the plumbing fixtures were retained. The new floor is tumbled limestone (for traction) with decorative glass accents set on a new concrete mud sub-floor. Mini-subway tile in Carrara marble was used for the tub/shower surround and was chosen for its combination of traditional look with a fresh interpretation. Because of severe code restrictions on clearances, and the owner's desire for an extra deep soaking tub, a custom-fabricated tub was required. The tub installation included a honed-finish granite top rim. The same granite is used for the countertop on the new custom vanity. The water mixers, faucets, spouts and shower fixtures are Hansgrohe, and the galvanized water supply and waste plumbing were replaced with copper. 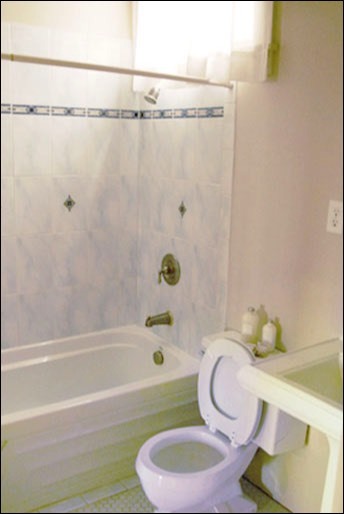 The toilet is an eco-friendly low-water Toto with soft close seat/lid. The ceiling and vanity lighting are fresh interpretations of traditional fixtures. Lighting, mirror, towel-bars, shower rod, door pulls and lockset are polished nickel. 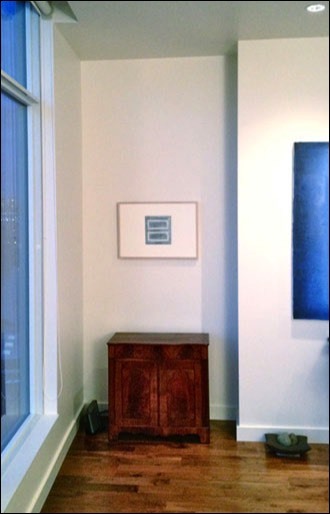 The photos above are an example of a custom built-in bookcase and credenza with marble top. This particular installation is in a high-rise condominium with contemporary architectural detailing. The challenge with this project was multifaceted. First, from an aesthetic perspective, we wanted the finished installation to look original to the condo - not like a ham-handed add-on. Second, the client wished to keep the on-site painting and finishing work to an absolute minimum. Finally, the bookcase needed to be light in weight but able to carry a significant weight of books once installed. More details on the torsion-box construction technique used to save weight can be seen in the "Fine Woodworking" section of this web site. After close examination, it became clear that the partition wall behind the bookcase could not carry the weight of the loaded bookcase since it was fabricated with narrow-gage steel studs. So the installation required the removal of the rear wall surface and the installation of conventional framing inside the wall prior to hanging the bookcase. 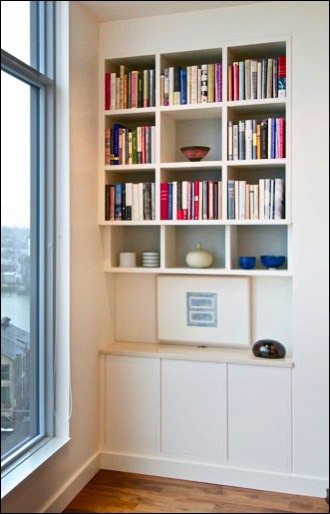 The bookcase and lower cabinet were fabricated to precisely fit into the alcove space, and both units were spray finished in lacquer offsite before installation, thereby keeping the on-site painting to minimal touchup of the surrounding walls. The project shown above looks simple enough, but the client requested that the handrail be able to carry the entire weight of an adult if necessary. The wall framing was a concern because of a pocket door in the wall cavity, and the wall surface was original lath & plaster. We wanted to minimize disruption to the wall to prevent the the scope of the project from creeping into a complete wall refit. 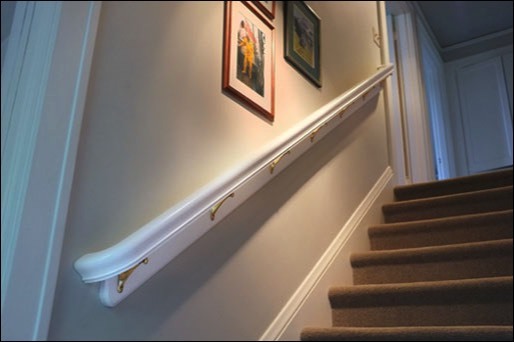 The design included the use of a hardrock maple backer board anchored to the existing wall which spreads the potential load throughout the wall framing, and provided a platform for numerous anchor points for the solid brass brackets holding the handrail. 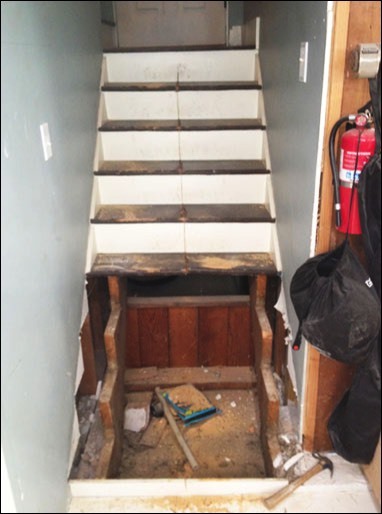 The project shown above is the replacement of the original (and rickety) basement staircase in a 1920's home. 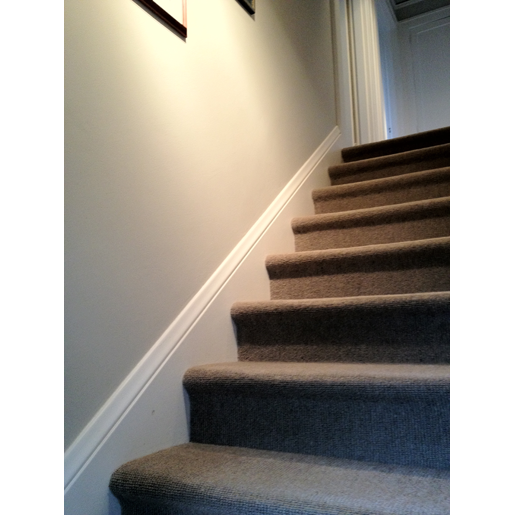 An important objective was to make the staircase significantly less steep by adding two additional stairs and lowering the stair-to-stair rise dimension while making the stair treads 2 inches wider than original for better footing. 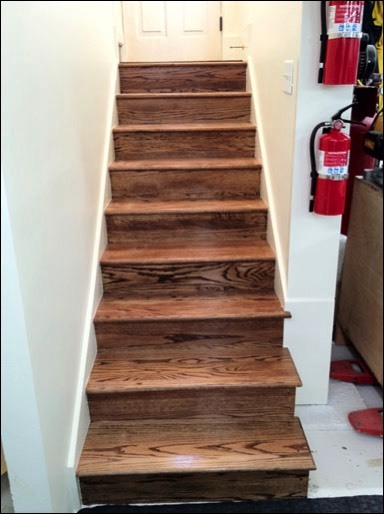 Since the basement would ultimately become finished living space, it made sense to fabricate the staircase from custom solid oak stair components with stain and varnish finish, and trim out the baseboard consistent with the remainder of the house.